SHERIDAN, Ark. -- AP Exams are scored with a formula using success rates on multiple-choice and free response sections. Scores range from 1 (not qualified) to 5 (highly qualified), with scores of 3 or higher generally qualifying for college credit or advanced placement upon entering college. Students at Sheridan High School can earn enough college credit through AP exams and concurrent credit through UALR and College of the Ouachitas to erase a semester or even their complete freshman year of college. 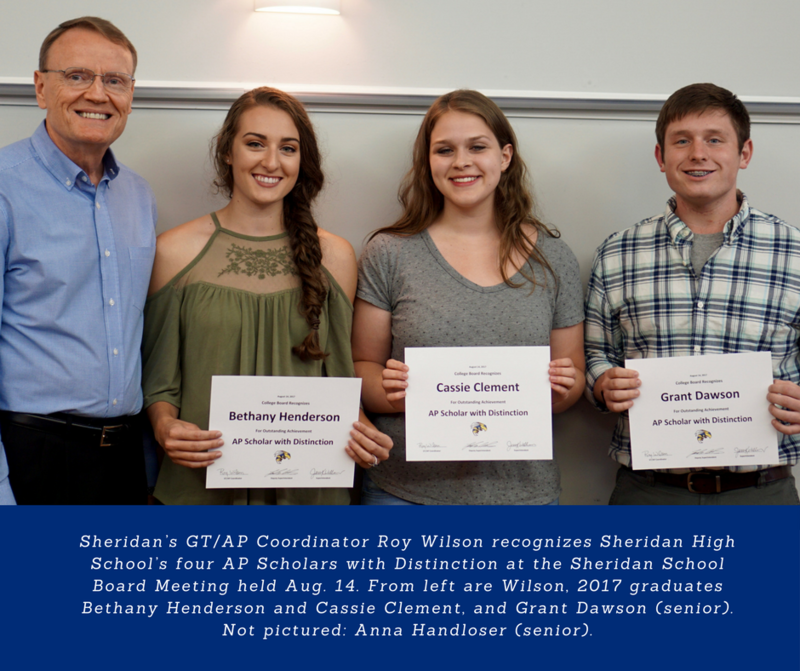 Earning AP Scholar with Distinction are current seniors Grant Dawson and Anna Handloser and 2017 graduating seniors Cassie Clement and Bethany Henderson. To qualify for this recognition, students must have scored 3 or higher on five exams with at least a 3.50 average on all exams taken. AP Scholar with Honor has been awarded to four students: Alice Delama, exchange student from Italy; 2017 graduates Moriah Manchack and Keller Smith, and 2018 senior Jacob Palmer. To achieve this level, students must have scored at least 3 on four AP Exams and have earned an average of 3.25 or higher on all exams taken. Thirty-seven students have qualified for the AP Scholar award by scoring 3 or higher on three or more AP Exams. Eleven members of the current senior class receiving this recognition are: Kamryn Alkire, Courtney Allen, Hannah Allen, Landon Bonner, Rachel Graham, Emily Kaucher, Catelyn Khamsisavang, Meredith Martin, Ellie Mayberry, Sarah Rawls, and Curt Smead. This recognition was also earned by the following 2017 graduates: Andrey Archer, Tristan Bodiford, Caitlyn Burke, Sean Fitzgerald, Alexandra Gray, Ashlynn Henson, Sean Holland, Nikolle Knight, Grant Martin, Madeline Martin, Taylor McGarity, Cason McGarrah, WilliamMcGinley, Maranda McLemore, Haley Morton, Brittney Osborn, Michaela Partridge, David Rainwater, Alyssa Savage, Luke Smith, Rachel Smith, Michael Stone, Hunter Strom, James Vance, Maggie Winters, and Alicia Workman. College Board offers any dedicated student an opportunity to earn college credit with acceptable scores on AP exams that are administered each May. The 2018 dates are May 7-18. “The AP and Pre-AP programs offered in grades 6-12 are open to any student willing to thrive within a rigorous curriculum,” said Wilson. Research conducted by Arkansas Advanced Initiative for Math and Science revealed that students who take AP courses in high school have an on-time college graduation rate of 73 percent compared to 33 percent of students who did not experience AP courses. Sheridan High School will offer eighteen AP courses during school year 2017-18, including the newest course, AP Computer Science Principles.